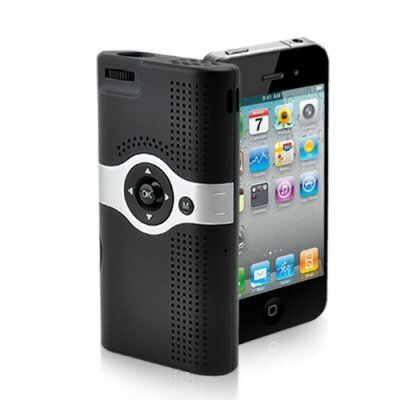 Successfully Added Mini Projector for iPhone 4 and 3GS (SD, AV IN) to your Shopping Cart. Project movies from your iPhone up to 40 inches diagonally with this high performance iPhone projector. You have hours of your favorite videos stored on your iPhone but need a more convenient way of enjoying them. You want to share them with friends but watching them on a tiny iPhone screen with weak speakers just doesn’t cut it for you. If this describes you then the E158 is just what you need. This powerful little projector gives you a bright and clear image up to 40 inches on any flat surface. There is even a built in 1 watt speaker so you can entertain the whole group. The built in battery provides up to 120 minutes of continuous play, or use the included power supply for unlimited use. This projector is not limited to iPhone use either. With the included A/V cables you can connect anything from portable gaming systems to portable DVD players with ease. Whether you’re camping, giving a presentation or simply traveling, this is the most convenient way to enjoy your media on the go. The best part? There is even a SD slot to access media such as: AVI, RM, RMVB, 3G, MPG, MP4 and more- everywhere you go. Bright and colorful 40 inch screen, pocket-sized, support for multiple media sources and much more make this one of our top picks here at Chinavasion. Order now while supplies last and we’ll include our full one year warranty and ship your product out within 24 hours. For best results use in the darkest environment possible. Yes, the E158 is perfect for watching movies.